Born in Long Beach, California, Judge Frank Ochoa traces his roots back to the Spanish land grant era. After earning BA degrees in English and History from UCSB, he studied law at U.C. Davis School of Law, graduating in 1975. In 1980, he became the Executive Director of the Legal Aid Foundation of Santa Barbara County. In 1983, at age 32, he was appointed to the Municipal Court by Governor Brown, making him the youngest judge in the state at the time. He also became the court's first Hispanic judge in this century. 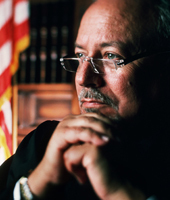 Judge Ochoa was elected to the Superior Court in 1996. As Presiding Judge, he managed the court through the unification process, merging the Municipal Courts with the Superior Court. He has been appointed by the Chief Justice to serve on the California Trial Court Budget Commission and on Judicial Council's Probation Services Task Force. He has also served on the Executive Committee of the Presiding Judges Advisory Committee to Judicial Council. He has served on the Executive Board of the California Judges' Association. Judge Ochoa started two successful adult drug court programs in Santa Barbara, the Substance Abuse Treatment Court and the Clean and Sober Calendar. These calendars offer intensive, court supervised treatment to drug offenders. He also started a Juvenile Drug Court program. He founded the Court Administered Appropriate Dispute Resolution program (CADRe), to provide early ADR opportunities for civil litigants. He has also served as a Justice Pro Tem for the California Court of Appeal. He is a former President of the Board of Directors of the Santa Barbara and Ventura Colleges of Law. He later served as a Professor at the Santa Barbara College of Law, teaching courses on Legal Process, Statutory Law, and Legal Ethics.